It was in 1897 Otto Wagner and a group of his most gifted students gave birth to another form of modernism in the visual arts, they called themselves the Secession. They created their own exhibition space later known as the Secession building. The Austrian Artistic Movement saw the population of Vienna itself grow from 400,000 in 1850 to 1,800,000 in 1900. It was city full of cafes, music and early cinema now known as the ODEON. It was an era full of artistic freedom that saw many artists local and international exhibit there work. The first exhibition was in 1898 in the Vienna Secession Building with works for artists such as Charles Rennie Mackintosh, Giovanni Segantini and Van Gough along side the works of a good proportion of Belgian Artists. 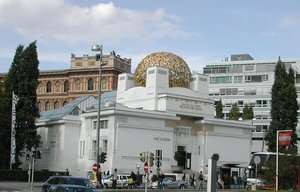 Today the Secession is the world’s oldest gallery devoted entirely to the presentation of modern art. Even today, its primary objective is to show current developments in Austrian and international art, in fact there exhibit “A CENTURY OF ARTISTIC FREEDOM” 1998 marked the hundred anniversary of first exhibition in 1898. It was a time where art did not only belong to the artsit but also to the critic, it was a time where art was free in away where artists where free to exhibit there work all over the world for all to see, there were no private exhibits so their work was open to all to critisize or praise.